New Orleans Talking to ACORN India’s Mumbai Director Vinod Shetty via Skype on Tuesday, he could hardly wait to tell me about the news headlines all over the country as Nobel prize winning, former World Bank economist Joseph Stiglitz added his voice to our longstanding opposition to Prime Minister Singh’s unilateral actions to modify foreign direct investments in multi-brand retail that would allow Walmart and others to come into the country and work their will. ACORN International’s India FDI Watch Campaign has been an active organizer and voice in this effort for the last 8 years. Stiglitz, now a Columbia University professor, is the highest profile economist to line up against these new, desperate political moves by the Prime Minister and the ruling Congress Party in advance of coming elections in 2014. PM Manmohan Singh announced a clutch of economic reforms recently, particularly in regard to allowing FDI in multi-brand retail. Do you think India needs to open up its market? India is an unusual country and different from many other developing and emerging markets. It has a large entrepreneurial class and has lots of savings, wealth. And this entrepreneurial class is very talented. So that raises the question as to why India needs foreign entrepreneurs in any sector, particularly the retail or the financial sectors. And what’s your answer to that? I have not seen a good explanation yet. To me, as most economists say, a little competition is good. On the other hand, the worry is that a company like Walmart may owe some of their success to its power and ability to drive down prices. Because they can buy things out and if that’s the case then they will use that power to have Chinese goods displace Indian goods. The real harm will not be to the retail sector. That is not the real problem. The harm will be to the Indian supply chain going into the retail sector. The other concern is that Walmart has succeeded in expanding its business by adopting abusive labour relations. Is that the experience of other countries where it has a presence? That is the experience of other countries. It is a business practice that you don’t want to import to your country. Bribery in Mexico, free-riding on healthcare, a policy against unionisation, discrimination against women—a whole range of accusations, some of which have been proved and others that remain accusations but are hard to win in courts. Why would you want to import such business practices into India? Many economists see the breakdown in social contract as one of the reasons for inequality. There is also a worry that Walmart will break down the social contract in India that is already frail. So how does one go about it? The other reply to these concerns is for India to have legislations to ensure these problems don’t happen. You should have good protection from large multinationals. 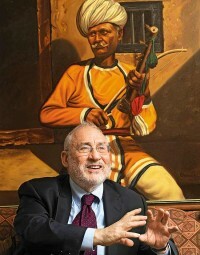 Stiglitz in yet elsewhere has also committed the heresy of questioning the impact on Indian farmers and their sourcing, which has been the one fig leaf the government has been hiding behind. Meanwhile in the United States two Congressman yesterday released emails from Walmart CEO Duke from 2005 while he was head of Walmart’s international operations (and frequently in India promoting the FDI changes!) proving he and the top officials had knowledge of the Mexico bribes from their legal counsels there and elsewhere. NPR reported this morning that Walmart has said that it had already admitted having knowledge of the bribes in 2005, just as ACORN International’s India FDI Watch Campaign was gaining steam and our work organizing Walmart workers and Florida alliances was underway in the US. They continue to be silent on why they did nothing to stop the bribes or modify their corrupt corporate culture or report the violations to any authorities in the United States or Mexico. Thanks to Professor Stiglitz, who is also credited in many circles for promoting the 99% percent argument about inequality among academics, we may have found a friend that will be harder to ignore in India and the United States, if it is not too late. This entry was posted in ACORN International, WalMart and tagged acorn india, Azim Premji Foundation, Columbia University, FDI India Watch Campaign, foreign entrepreneurs, Jospeh Stiglitz, multi-brand retail, mumbai, Prime Minister Singh, Vinod SHetty by Wade. Bookmark the permalink. We are here to introduce a loan program that will help improve your financial situation, economic and relieve you of all financial crises. Loan request: You have to be able to articulate how much your business needs, how the loan funds will be used, the type of loan request you need, and how much capital you have on hand. Specialized in providing loans from the range of € 5,000 and above all, as car loan, we offer loan in the short and long term for customers at a rate of 3% etc. If you really acknowledge this content, you are to send the details information to the account overleaf. Enjoy Online Banking and Best Services Offer!!! development of the country is subjected to corruption. In this rising inflationary era if Walmart brings down prices due to its capacity of bulk buying what seems to problem? It will be a boon to the lower middle class and increase their saving capacity. This certainly will fill the coffers of the government through indirect taxes which can be used for nation building. That’s where the influx of Foreign Direct Investment will have the greatest effect. As for bribe taking both the demander and giver are equal. But then again no businessman gives bribes unless demanded. We need FDI. Period. All upright citizens should shake of this demonic plague of corruption and make India the hotspot of FDI.